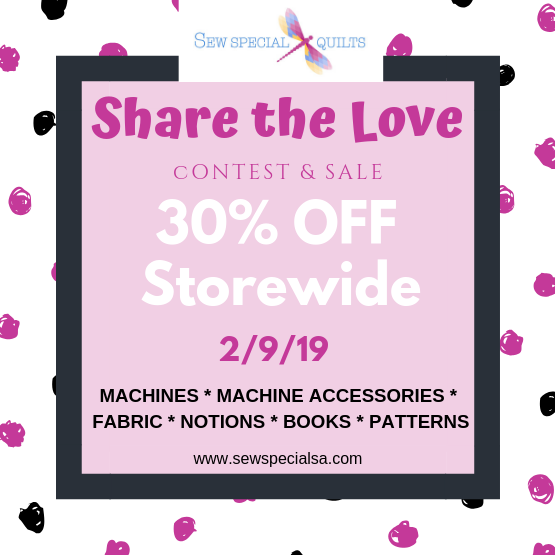 JOIN US FOR OUR 5th ANNUAL SHARE THE SALE AND CONTEST! Machines, Fabric, Precuts, Patterns, Books, Notions, Thread, Stabilizers, etc. We have TWO contest and TWO baskets this year! 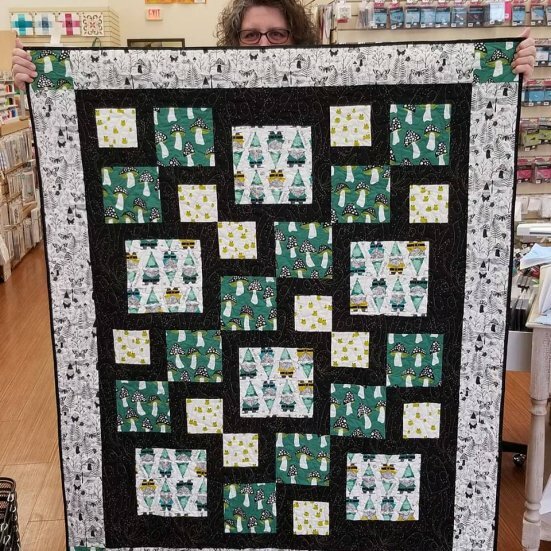 Beginning the morning of February 4th we will post a quilt and sewing related question on Facebook and we'd LOVE to know your answer. Ex: What thread color do you LOVE to piece with? One answer per day per question gets you entered into our basket drawing. * Post a picture of you holding a quilt or sewing project. The picture needs to include your eyes and the project. Get creative and have FUN! If you don't participate in social media you can EMAIL your entries to mmangold@sewspecialsa.com or show us in person. By emailing or allowing us to photograph your entry you are giving us permission to post on all social media accounts. * Contest runs 9:00 a.m. February 4th until 12:01 a.m. February 9th Winner will be drawn at random (using an online Random Number Generator) on February 9th at 9:00 a.m.. Winner will be announced via social media. * Each location will be giving away TWO Baskets filled with quilting and sewing goodies. Each with a retail value of $100. * Participants will need to be able to pick up their prize in person no later than February 16th or another winner will be drawn. * No purchase necessary. Purchase does not enhance chance of winning. Void where prohibited. * Contest is in no way associated with Instagram or Facebook. By entering this contest you agree to a complete release of Facebook and Instagram from any or all liability in connection with this contest. * Contestants need to be at least 18 years or older. SSQ Staff and family can participate but are not eligible to win. * Each participant is responsible for monitoring your social media accounts for prize notifications. * No substitutions or cash equivalent of prizes permitted.